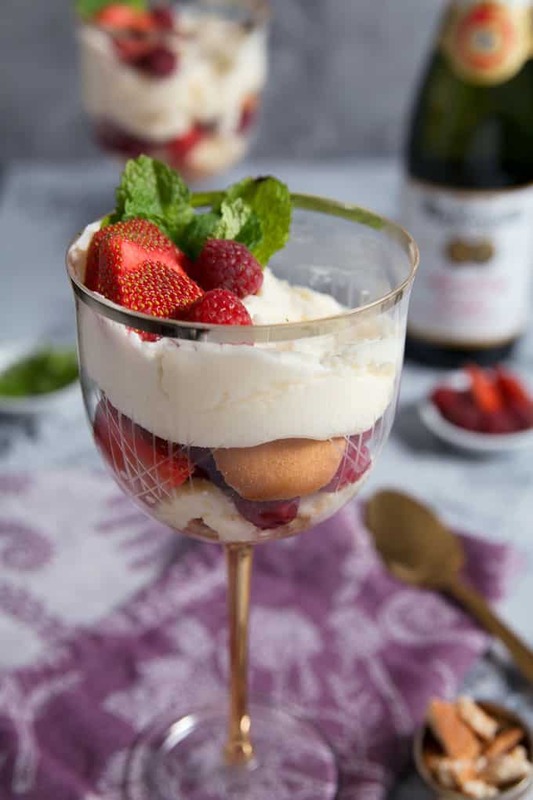 These raspberry strawberry parfaits are the perfect Valentine’s Day dessert! 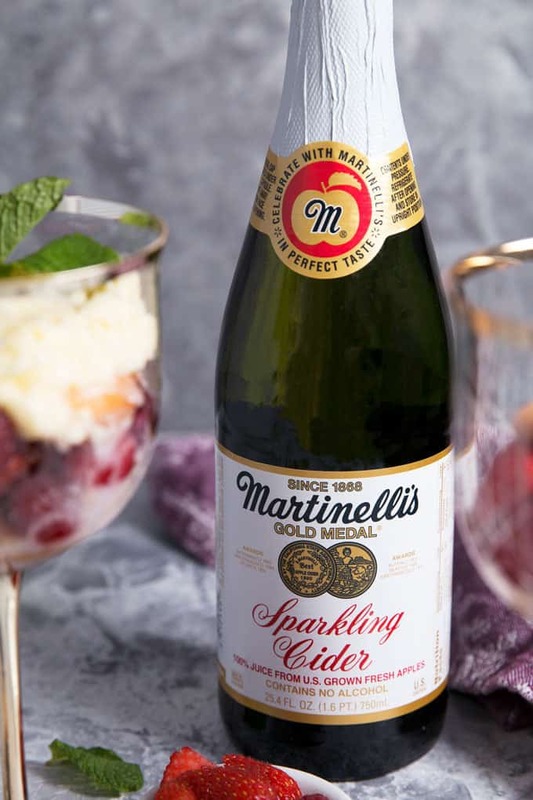 This recipe is easy to make and has an extra fruity taste thanks to sparkling cider frosting using Martinelli’s Sparkling Cider. This post is sponsored by Martinelli’s – all opinions (and my love for their sparkling cider!) are my own. With Valentine’s Day right around the corner, I have desserts, sweets and all things red on the mind. You can probably tell when you look at this delicious dessert, can’t you? February 14th makes me think of hearts, flowers and all red fruits – raspberries and strawberries in particular. I always walk by the berry section when I go grocery shopping, even if I don’t plan on buying berries. If they’re on sale, you’d better believe that they wind up in my cart. One of my favorite cakes ever was filled with buttercream frosting and a huge number of fresh raspberries and strawberries. It was the inspiration behind today’s dessert recipe. 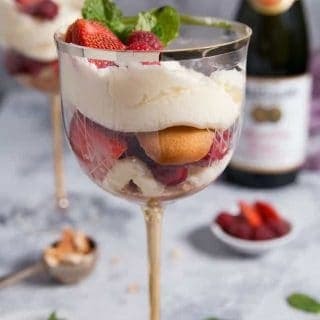 To start making these raspberry strawberry parfaits, I first soak the berries in some of the Martinelli’s Sparkling Cider. We will only use a little of it for the frosting and I really wanted that fruity apple flavor in this dessert. Martinelli’s Apple Juice, Cider and Sparkling Cider is made from 100% juice from U.S. grown fresh apples. I use Martinelli’s Sparkling Cider year-round to make fauxmosas (like this apple cinnamon cranberry fauxmosa recipe) so there is always at least one bottle in my pantry. And it is the perfect addition to any desserts! While the berries are soaking, I make the Martinelli’s Sparkling Cider buttercream. You can use a hand mixer or stand mixer for this part. I just love the smell of Martinelli’s Sparkling Cider when I pour it over the butter/powdered sugar. So sweet and effervescent! Next, crush up some vanilla wafer cookies. This can get a little messy – place the cookies in a plastic baggie to contain any crumbs. Now it’s time to start assembly. I like to use pretty wine glasses but just about any vessel will work. 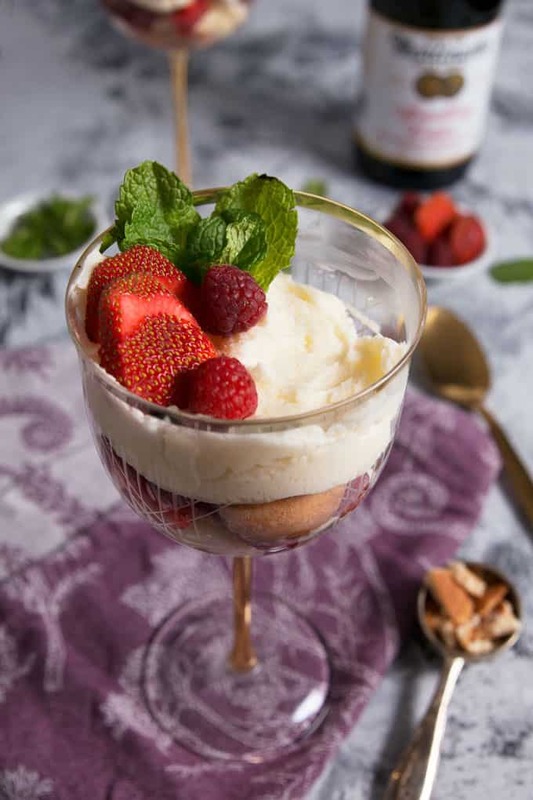 Mason jars, champagne flutes, and even plastic cups (for dessert on the go!) can be filled. Start with a layer of crumbled vanilla wafer cookies and then top that with a thin layer of sparkling cider buttercream frosting. Spoon some of your soaked berries on top of the frosting. 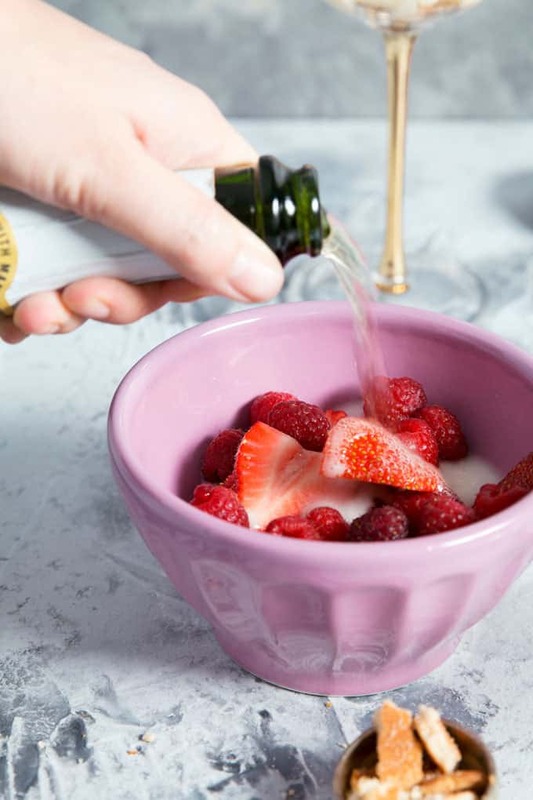 It’s up to you if you want to also spoon some of the liquid – I usually don’t because the berries have absorbed a lot of the flavor of the Martinelli’s Sparkling Cider already. Next, top the berries with several more vanilla wafer cookies. They are the perfect base for the next layer – more sparkling cider buttercream. This is my favorite part! I love piping frosting. 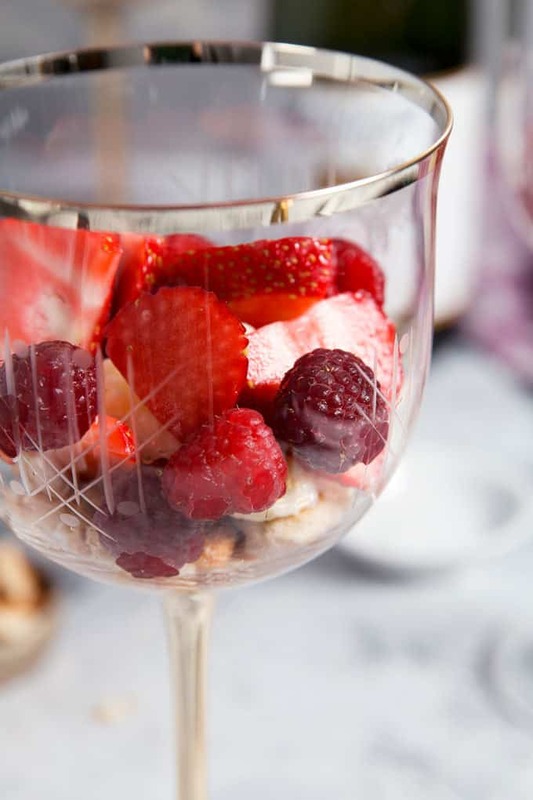 Garnish with more fresh raspberries and strawberries. I also add a few mint sprigs – that green color is so pretty next to the red fruit. This is a family-friendly dessert that everyone will love and is super easy to make! And if you have any leftover frosting, make sandwich cookies with some of those vanilla wafers. 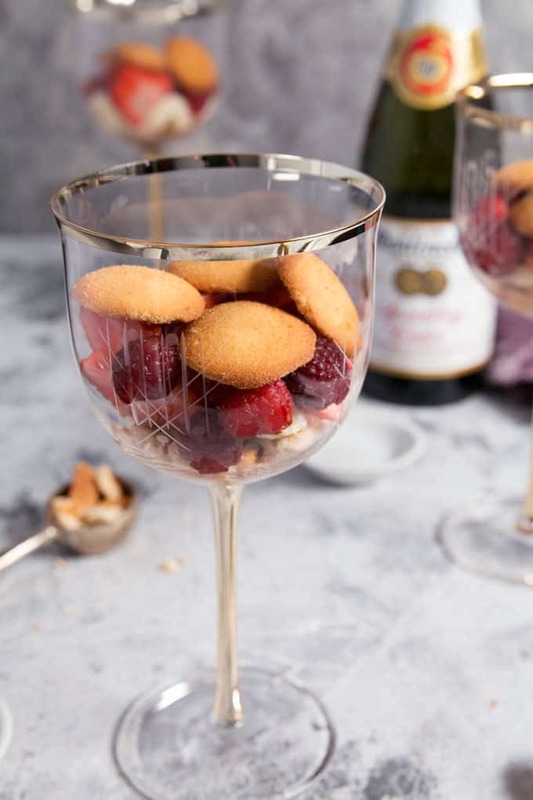 These raspberry strawberry parfaits are the perfect Valentine's Day dessert! 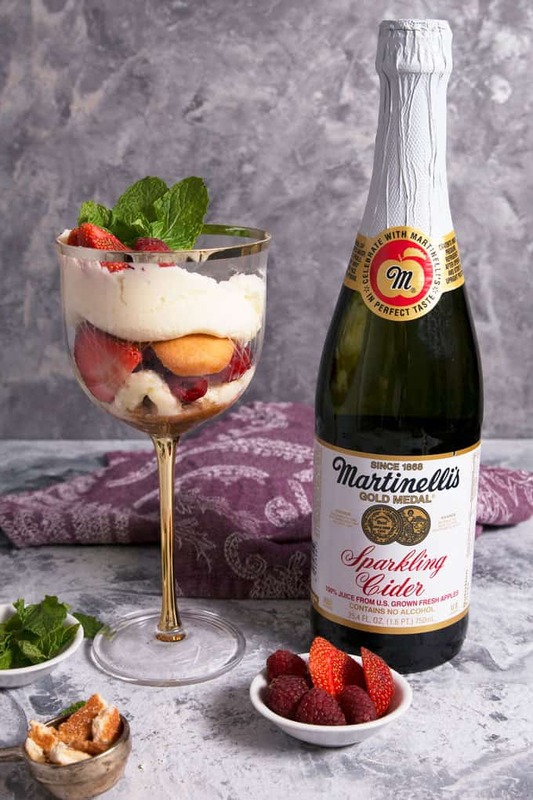 This recipe is easy to make and has an extra fruity taste thanks to sparkling cider frosting using Martinelli's Sparkling Cider. In a medium bowl, add the berries and the 1/2 cup of sparkling cider. Let soak for 10 minutes. In a small bag, break half of the vanilla wafer cookies into big chunks. 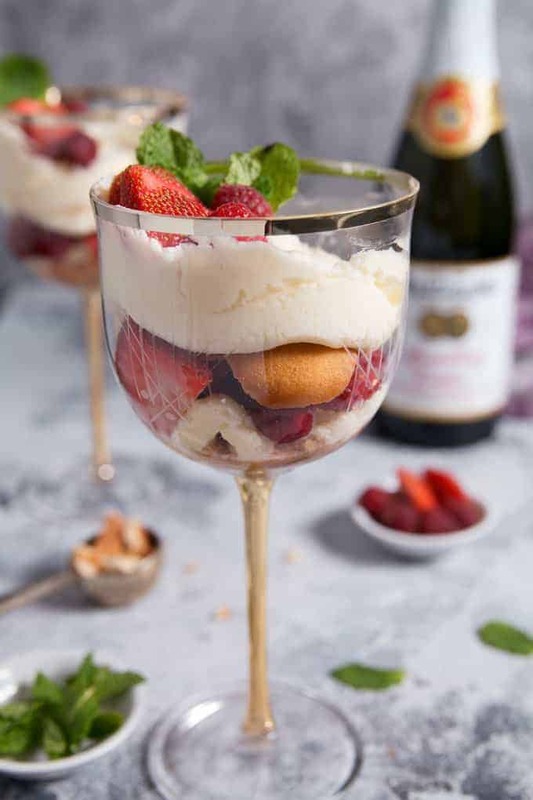 Assemble each parfait as follows: 1/4 crumbled wafer cookies, thin layer of sparkling cider frosting, 1/4 cup soaked berries, 4 vanilla wafers, more frosting. Garnish with raspberries, strawberries, and mint leaves as desired. To make the sparkling cider frosting, add powdered sugar to a mixing bowl. Add the softened sticks of butter and beat on low until powdered sugar is incorporated. Then add the sparkling cider and increase mixer speed to medium-high. Scrape sides and bottom of bowl often. When completely mixed the frosting may appear dry. Add more sparkling cider if necessary, a little bit at a time, until frosting is the proper consistency.